The Grayson Trilogy, available for the first time as a boxset, is a series of mysterious and romantic adventure stories with Emma Grayson at their heart. These emotional and thrilling reads have captivated readers with gripping storylines that will keep you guessing and enough twists and turns to ensure you’ll want to spoil yourself with just one more page before bedtime. A woman recovering from tragedy. A man with a troubled past. Will trust build a bridge between them or will it be destroyed by dark secrets? Shocked when she discovers the Manor’s powerful and shadowy connections, Emma fears the clandestine activities will put her quiet job and new romance at risk. But after the estate comes under attack from Russian gangsters, she must put aside her doubts to save lives, with or without Trent’s help. 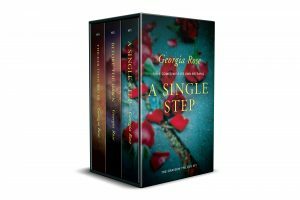 If you like engaging characters, dark twists, and heroic finales, you’ll love Georgia Rose’s captivating series. Start reading The Grayson Trilogy today to discover the mysterious and romantic adventure that awaits Emma!